“Now, that I don’t understand at all,” Quentin says, just like everybody does in this storyline, about everything, all the time. The Leviathan story may be one of the least understood in the history of the dramatic arts. And for the first time in my life, I have to ask the question: Is Julia Hoffman right? Because the thing we need to remember is: This is not normal. Collinwood is divided, as never before, and the tactics that Julia has championed in the past — smiling, lying, setting up mad science labs in the basement — don’t seem to be working the way that they used to. A vicious, cruel, power-hungry monster is taking over this town, and he wants to reshape the world to suit his purposes. This isn’t a revolution based on principles or policies. The mad emperor-king only cares about two things — his own vanity, and the destruction of his enemies, not necessarily in that order. And the worst part is that he’s hypnotized people that we love — good people, kind people — charitable matrons and eccentric millionaires and small business owners, and even some of our own children — all supporting this tyrannical monster, even if it’s not in their economic self-interest. Apparently, the Leviathan-leaning people want a leader who’s going to shake up the establishment at the big house on the hill. So here’s the establishment, shaken. Roger Collins is a well-to-do one-percenter, who’s never really had to get involved in local politics before. There have been several fierce battles with threats to humanity right in his own house over the last couple of years, and for the most part, he’s stayed above the fray. He’s really only interested in monsters if he can marry them; everything else has to handle itself. But now he’s riled up, and the flashpoint issue is immigration. 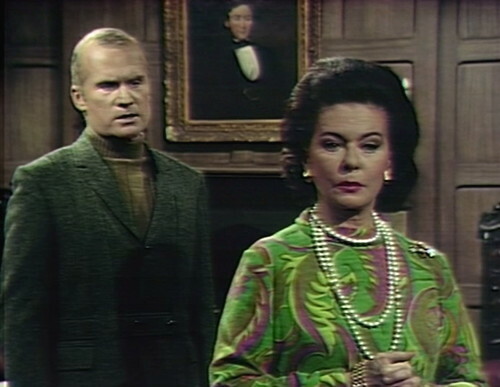 Recently, two refugees from the antiques shop fire have taken up residence on the Collinwood estate, and they haven’t been properly vetted. Elizabeth’s ex-husband Paul was brutally murdered a month ago by an enormous, unearthly monster that pushed its way through a couple of walls to get at him. Now the police are convinced that they have the murderer in custody — Philip Todd, a harmless antiques dealer who probably weighs 160 pounds even. Apparently, the Collinsport authorities are under the impression that Philip was armed with a backhoe, a flamethrower and a tub of Creepy-Crawlers Plastigoop. And now Liz has invited Philip’s wife Megan to stay in Collinwood, along with a surly, itinerant photographer. Roger doesn’t know exactly what’s going on here, but he knows funny business when he sees it. He has to; he’s a Collins. After ten generations of nothing but funny business, the Collins family’s fight-or-flight instincts are razor-sharp. Plus, somebody pulled Paul’s coffin all the way out of his grave and ran off with the body, stashing it who knows where and doing who knows what to it, and Roger has no patience for cadaver shenanigans. “There’s something going on around this house that I don’t like,” he declares, “and I’m going to find out what it is. I promise you that!” And then he just marches out of the room. That’s a pretty good exit line that ordinarily would be enough for a dramatic sting and a commercial break, but the show has reached the point where human conversation doesn’t qualify for a music cue anymore. 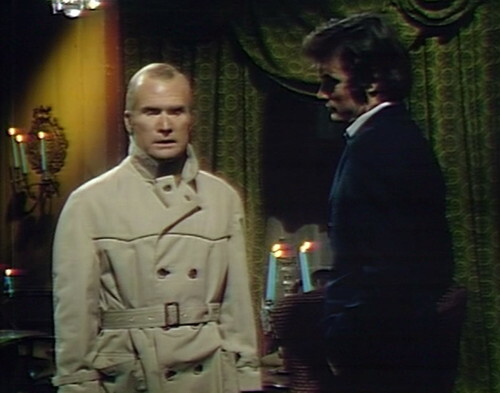 Roger ends up at the Old House hoping to talk to his eccentric vampire cousin, who isn’t home, so Roger talks to his immortal ex-phantom ex-werewolf ex-zombie ex-oil painting cousin instead. 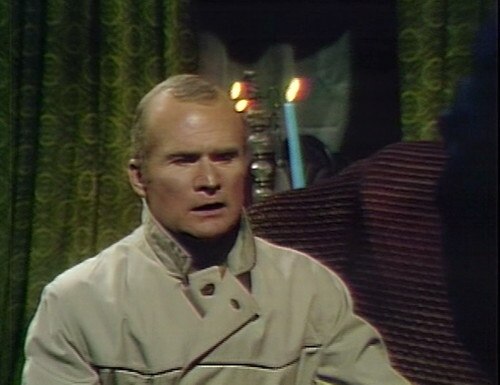 Now, it’s important to note that Roger doesn’t know that Barnabas and Quentin are monsters, past or present. There’s also a current werewolf living on the estate who had a brutal, bloody fight with someone in this very room a few weeks ago. These facts fall into the category of something going on around this house that Roger feels okay about, because they mostly keep to themselves and they murder people that he doesn’t know. But now people are secretly plotting in the Collinwood drawing room at the top of their lungs, and this has finally gotten onto Roger’s radar. In the past, there have usually been a few people at Collinwood going on with life as usual while a slow-burning blasphemy has taken place in an abandoned wing of the house, or in the basement next door. Elizabeth has usually stayed outside the fray, and David’s coasted through a couple catastrophies. But this time, practically everyone Roger knows is caught up in this insane gang war between the Leviathans and the regular people, and he’s painfully aware of the gulf that’s opened up in his understanding of the world. He’s lost in his own house. 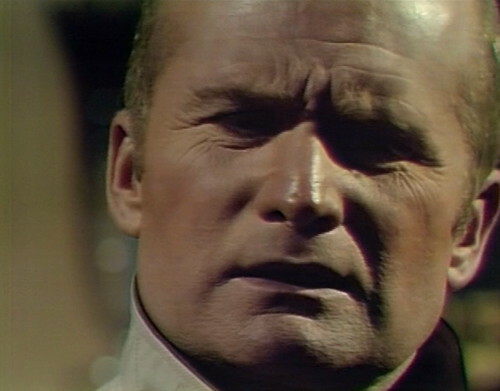 If he was talking to Barnabas or Julia about this, they would lie, spinning some kind of logical explanation out of straw, and Roger would leave the conversation just as befogged as before, still living at arm’s length while his family tears itself apart. And then he does something revolutionary. He tells Roger the truth. Not the whole truth, obviously. He leaves out all the stuff covered under the Murder Club non-disclosure agreement — the vampires and witches and mad scientists who pass for protagonists these days. But Roger gets enough edited highlights from the episode guide to understand the shape of the problem they’re facing. I’m not sure where that idea comes from, that they’d kill David. That seems made-up to me. But it’s a little lie, compared to all the truth Roger just received, and it sounds good, coming from Quentin. And Roger looks into Quentin’s eyes, and believes him. This is a thing that Quentin can do, which justifies his inclusion in this new “Barnabas, Julia and myself” task force. Barnabas comes up with the terrible plans, and Julia spins all the lies, but when they need somebody on their side, Quentin is the one to do it. When Quentin recruits you for something, you get recruited. He’s an expert at seduction; this is what he does best. Roger doesn’t have a chance. So there’s a lesson here for all of us, probably. We’re facing a huge problem right now — Leviathan people, swarming into a house that we thought was ours — and it feels like they’re everywhere, all of a sudden. There are more of them than we thought there were, and some of the people that we love are rooting for the other side. But there are allies out there, and we can reach out to them. We shouldn’t shut them out, just because they haven’t been involved in our struggles before. I don’t know how well that works, if you’re not a Quentin-level persuasion machine, but it’s something we ought to try — telling the truth, and asking for help. In act 1, when Liz knocks on the drawing room doors, there’s a weird electric hum for a moment. When the camera pulls back on Quentin and Roger, the boom mic can be seen at the top left. At the beginning of Amy’s scene with David, you can hear people walking around in the studio, and a door opening. When Amy bends down to look at the burned book, there are bits of yellow marking tape on the floor. Quentin guesses that Roger is upset, and Roger asks, “Is it as bad as that? Does it show that much?” Quentin says “Yes,” as Roger smiles. When Roger agrees to stay and talk to Quentin, the camera pulls back, revealing the other side of the Old House “staircase”. A moment later, someone in the studio coughs. In the last shot of David and the hanging man, the camera pulls back too far, and you can see the edge of the set on the left. They’ve been doing that a lot lately. David is listed in the credits as Daniel Collins. There are more scenes in David’s room today, so here’s an update on his stuff. When we last saw his room in episode 937, there were a few missing items: the football player, the girl with a protest sign, the sailboat and the ship in a bottle. Today, the football player and the girl are back, along with the US map, the robots, the nutcracker soldier thing, the cars, the purple concert poster, the cat picture and the crummy globe. Still no sign of the sailboat or the ship in a bottle. Stay tuned for an exciting David’s room update tomorrow. This is the last episode for Amy Jennings, who leaves town with her brother during the Parallel Time story, while no one’s looking. Denise Nickerson will appear until July as the PT version, Amy Collins. The Hanging Man! This was so creepy in 1970. Then we found out who he was and we were terrified. Not having looked ahead for spoilers, I don’t know yet who the ghost is. I always get a little verklempt when Roger shows how much he loves David. Their animosity was so palpable during the early days, and their reconciliation arc played so beautifully and so naturally by both actors, that it hits me right in the gut sometimes. Totally brilliant analysis of the Murder Club org chart. Love the implied Jeb/Donald reference! The electric hum can happen when the boom mic voice coil gets too close to a coil of power wire in the lighting truss overhead. They let Roger into the club, sorta. (Must have been the trenchcoat; seems to be THE men’s fashion accessory for 1970. Well, trenchcoats and neckerchiefs.) I wonder what his reaction would have been if Quentin had let him in on the whole story, witches and werewolves and vampires, oh my! PPS I gotta see how many of these smileys work. These are the last few episodes where we see Roger Collins on screen. (The upcoming parallel time Roger is different.) I was really bummed that Roger wasn’t present during the 1970 Destruction of Collinwood storyline that happens six months from now. Yes and that’s such a shame. So much possibility for his character wasted. 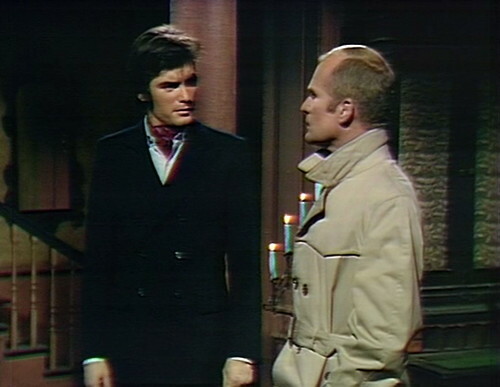 Roger was one of the best characters on the show, and might have made the second haunting more bearable, especially if he related it to these earlier possession stories — though the writers probabkh wouldn’t have permitted such continuity. 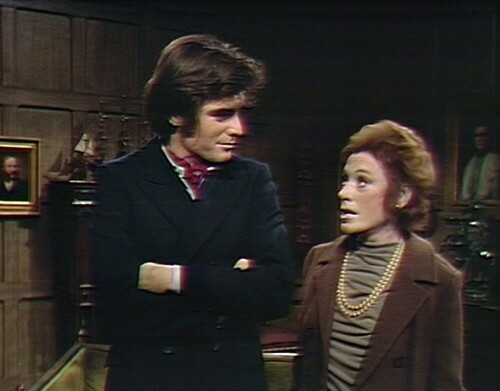 Will, I can just imagine Edmond’s Roger telling Liz that the first thing they would have to do is to get Hallie Stokes out of Collinwood: if she’s not whining that she’s scared, she’s egging on everything that’s going on. Yes indeed. Hallie ranks up there with Dr. Lang, Harry Johnson and Peter Bradford as most annoying DS characters ever. If Hallie is the character I’m thinking of, I’m afraid my problem with her is an extremely “shallow” one, one that could be labeled sexist as well – the sight of David with a female sidekick who’s noticeably taller than he is. Though in all fairness to me, that did come after David and Amy as a team. The writers never made AMY look like a wind up talking Barbie doll. Maybe they expected Hallie to get by on her looks. Darn that Five Actor Limit. 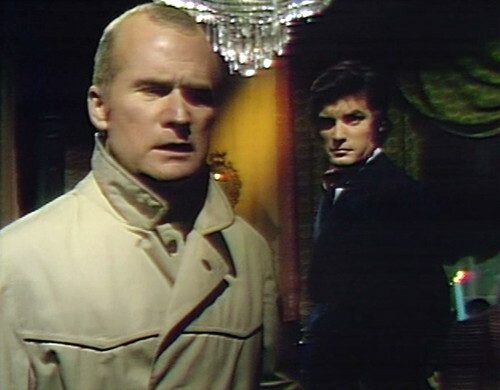 But I think that PT Roger is Edmonds’ finest performance, with more great stuff from him after that, too. That guy delivers. I’ve always felt that Edmonds’ portrayal of Joshua Collins back during the 1795 storyline was nothing short of brilliant. He (and the writers, of course) gave the character a cold-hearted grandeur and gravitas that transformed him, by the end of the storyline, into a truly tragic figure. And he was a real pro. He pretty much always knew his lines. No matter how crazy the antics got, the Louis Edmonds character always grounded everything in an emotional reality that made it all work. If the love child of George Sanders and Roddy McDowall had a baby with a genetic Frankenstein monster of the characters in every Hitchcock movie, that baby MIGHT grow up to be as awesome as PT Roger. 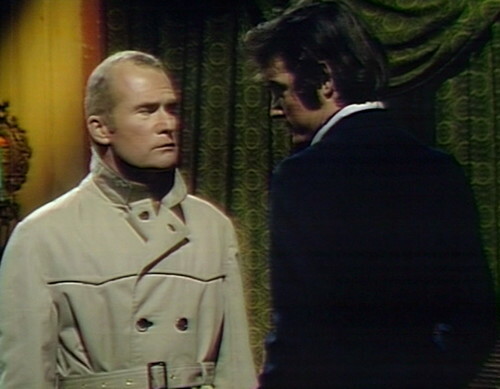 I think that the absence of Joan Bennett/Louis Edmonds scenes during the 1840 and 1841 PT stories was a big mistake. Those two were meant to do scenes together! Just watched this for the first time tonight on Amazon, and read the blog as I watched. Beautiful analysis for challenging times, Danny. I read this entry just one week shy of two years under Leviathan rule. Being optimistic about what the next two years will bring isn’t easy (hang in there, RBG!) but your final paragraphs are encouraging. Thanks, Danny. Was there a sale on trench coats at Ohrbach’s this week? Willy wore one yesterday.